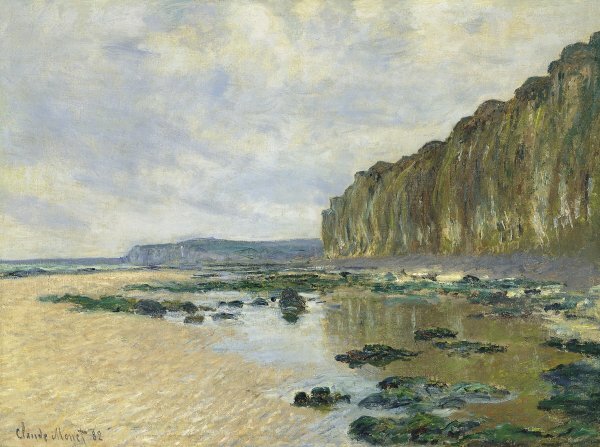 In February 1882, Claude Monet left Poissy to travel to Dieppe and Pourville, on the Norman coast. He remained there for two months, on his own, and painted during his long sojourn 36 works, 23 of which were bought by Paul Durand-Ruel for the total sum of 8800 FF. The paintings were bought for about 400 FF apiece, and the one analysed here was acquired by Durand-Ruel in April 1882. In March 1882, Durand-Ruel was selling Monet's paintings for 2000 to 2500 FF each, if we are to believe a letter from Boudin to his friend Ferdinand Martin. The price of Monet's works increased rapidly in the years 1880-1890 and Durand-Ruel used to reserve the largest part of the artist's production. In 1882 Monet was concerned by the uncomfortable position he held next to Alice Hoschedé, who lived unofficially separated from her husband. He took on the everyday expenses of the household which included his own children and Alice's. But his worries did not hinder his passion for painting. During his stay, disappointed with Dieppe, Monet discovered Pourville and its surroundings, and stayed in a small hotel and restaurant, "A la renommée des galettes", very close to the waterfront. He worked alone: "I have always worked better alone, drawing only on my own impressions". On 6 April 1882 he told Alice about his work, and indirectly informs us on his own technique. He would sketch several paintings at the same time, according to the weather. He then had to find the same atmosphere in order to take up each painting again. This technique was described by Guy de Maupassant in Étretat in 1886. He revealed to Alice: "the majority of my studies are executed in ten or twelve sessions, and many in twenty [...] I still need, in order to finish the paintings properly, two days of sunshine and two or three of grey weather and that, of course, dropping several works [...]". And he added the following day: "Yesterday I worked on eight studies; supposing I worked on each for about one hour [...]". So Monet worked at the same time on several paintings of the same place or of places close by. At each session, he needed to find again his first impression. Then, he finished the works in his studio and kept them until he could observe them all together, before entrusting them to his art dealer. This was precisely what he did with the series of paintings of Pourville and Varengeville. From his stay in Pourville, Monet brought back views of the cliffs, of the church in Varengeville and of the customs officer's hut. The cliff of Varengeville and the beach at Pourville were painted in several sessions from a rather classical angle: the line of the horizon is roughly in the middle of the composition and the viewer is placed at a certain distance, at the same level. We are far from the bird's eye views and the close-ups which Monet often chose, and this work recalls more the cliffs painted by Jongkind, Millet or Isabey. Monet had already treated the subject of the cliff at Étretat in 1868-69, and again in 1880 and 1881 at Petites Dalles and at Fécamp, where he depicted the subject in close-up. The technique used to paint this work differs from the pictures executed near the customs officers' hut during the same stay. The brushstroke applied in short curved touches is substituted by long sharp strokes on the cliffs, almost evoking falling water. This technique gives volume and strength to the rocks, while at the same time it conveys dynamism and evokes their mineral and plant components. It is an expressionist technique which Monet used in other works such as Church in Varengeville, Morning Effect of 1882. This highly sensual representation of the cliff is tempered by the bottom part of the painting. The transparency, the reflections, the quietness and horizontality of the water are a counterpoint which softens the verticality and density of the rocks. The puddles of seawater in the foreground are highly poetic. They bring to mind the harmonies of sky and water dear to Boudin, who excelled in the representation of low tides and quiet water caught between the sand and the rocks. The style of this work follows in the wake of the art of Eugène Boudin and Charles Daubigny, two artists highly regarded by Monet during his entire life, and who made a strong impression on him in his youth. The cliff and the low tide make up a strong group which is counterbalanced, like an attenuated echo, by the left-hand side of the painting. Here, the elements are blurred, the colours are diluted and become monochrome (the sand and the cliff in the distance), while the sky delicately links the different parts.